Kibwe Daisy explains how to transfer an image to your wall and color it in with Sharpies(!!) to make a cool Marimekko-like graphic for your living room. Read about his project here at Curbly. Kibwe apparently has a very lenient landlord. Add that to your list of supplies. My "landlord" would think I was nuts. way cool. I love marimekko. Neat idea, but there's no way I'd write on my walls with a Sharpie! I own them, and don't want to have to deal with the headache of covering over something like that someday! Thanks for posting this. So cool I would love to do this as a headboard. I think it would be a great inexpensive idea for a guest room or for my son, in a great pop of color. Great idea, but why not do it on a canvas that you can take with you wherever life takes you. I am NOT showing this to my daughter who just got in trouble for drawing on the wall with a sharpie. I guess his mom was more lenient. We have marimekko designed mobile phones in Japan. 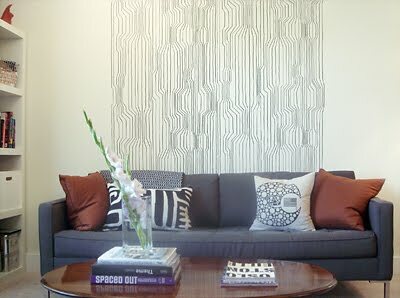 Sharpie markers are easily removed from a painted wall with a Mr. Clean Magic eraser. Trust me! Also, Killz primer will also cover it easily. Megumi, you're so lucky! I need to move to Japan, I guess. clever project! i would love a wall this fashionable. Fine, I won't move to Japan, Mom. Relax. This looks great but beware...after many years of doing set painting for theatre, I dread anytime someone has used sharpies. They are impossible to paint over. Even Kills primer won't cover it. If you want to do this project, I'd recommend using water based paint markers. You can get them at any craft store. That is so cool! I wish I could do that. Its really convenient and shares a lot of good tips! omg I finally found what I want to do with a wall in my kitchen. love love love!